This topic contains 4 replies, has 3 voices, and was last updated by Mitälie 3 weeks ago. A: I have played holy during the leveling process and some LFR. A: I am willing to respec. I should also mention that I am willing to play other classes and specs if needed. I have a monk (mistweaver and windwalker), DK (frost and blood) and rogue on another server but I can transfer them here. These are all classes I have experience raiding with. A: My previous guild during Mists and WoD was WoW Legacy on Mazrigos. The guild eventually fell apart during Blackrock Foundry due to lack of attendance and people transferring away. I took a break after that due to school. In early Mists and late Cata I played in CORE, also on Mazrigos, where I eventually became an officer. CORE was a great guild with mostly Norwegians and we merged with WoW Legacy in Mists due to mutual benefits. Before that, I was in a few guilds on my old server Azjol-Nerub. During late Wrath I raided in The Snake-eyes and before that Bratt Flaskeføring (Chronicles of Freedom). My first raiding guild was Vita Luna on Azjol-Nerub. I was there during most of Vanilla. My reasons for leaving most of these guilds were that they eventually became inactive or that the people whom were most active left for other guilds. A: My first raid was in Vanilla when my guild started raiding Molten Core and later Zul’Gurub. I was very active on my little hunter and raided pretty much through the whole expansion. We later started BWL, AQ40 and AQ20 before TBC hit and we got up to Firemaw in BWL and only downed one boss in AQ40. In TBC I joined a guild with my BF and we went into Karazhan. We also did some of Black Temple and Serpentshrine Cavern but I did not raid very hard in TBC. Wrath came out and now I was ready to get back into it. I raided through the whole expansion in two different guilds, still on my hunter. We cleared pretty much everything except for LK 25HC (got him on 10HC though). In Cata I started university and had a break again. I came back towards the end of the expansion to do Dragon Soul with a friend I met at school (Xytric) and quickly got the hang of raiding again with his help. In Cata I switched to a horde (YAY!) Blood DK. This was the first time I had tried raiding with something other than a hunter and I was instantly hooked on playing other classes and specs. During this time, I made an effort to become better and really try to get a deeper understanding of my role and spec as well as other classes and roles in the game. When mists rolled around I stuck with my DK for the start of the expansion as frost spec. 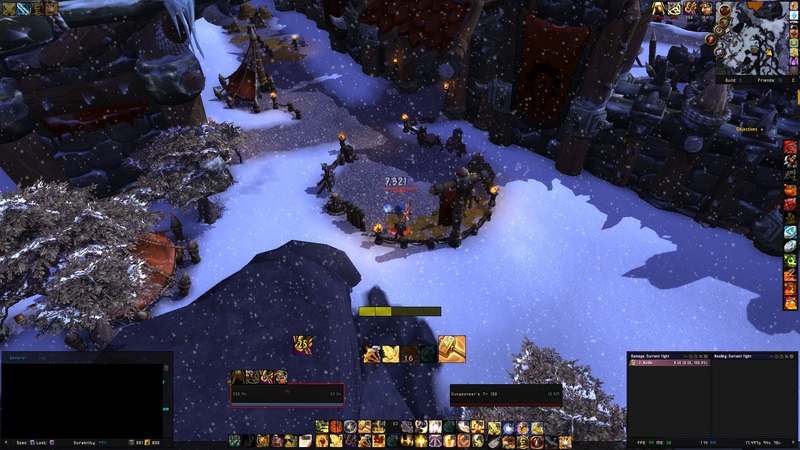 The guild eventually needed more healers and I leveled a shaman and later a monk to fill the missing spot. During the remainder of mists I healed and offspec dps’ed on my monk. We did MV, HoF, TES, ToT on normal and SoO on mythic up to Blackfuse. In SoO I met Dawnille. He, Xytric, and I quickly became good friends and we played a lot together. WoD was a strange time for me. I started as a monk and then eventually leveled a rogue and started playing sub during Highmaul. I had always wanted to play a rogue and since the guild was not lacking any specific role this was the perfect opportunity to do so. I still healed on my monk later in the expansion when required. In Highmaul we downed Kargath and Twin Ogron on mythic. We cleared BRF on HC but never got anything down in mythic, even though we tried. I haven’t raided HFC yet as I just recently came back to the game to prepare for Legion. But I will try to get into some pugs to at least see the content before Legion hits. A few weeks back I rolled a paladin on Haomarush to be with Dawn and I really like it. I have some experience playing a paladin earlier in mists in some normal SoO pug raids but not as a main character. I love to do different things and I chose a paladin because I can change roles if needed. As I mentioned earlier I can also play other classes or roles if preferred. Q: Where do you read up on your class? A: I watch a lot of videos on how to play optimally (preach gaming and others). I also love to read about the class I am playing on different forums and guides (mostly icy veins). I also speak to people that play the same spec or have experience playing it. I also look at people’s armory to see what they are using. I try to keep myself updated on how to play my class on a decent level. Q: Do you use weakauras? A: Fiber connection, about 60/60 wired. Wednesday 20:00 – 23:00 – Yes. Thursday 20:00 – 23:00 – Yes. Monday 20:00 – 23:300 – Yes. A: I am going home to my family some time during the late part of July. I will inform you straight away when the date is set. Q: Why do you want to join The Hand of Shadow? A: I want to join The hand of Shadow to play with my friends and hopefully make new ones. I also want to raid on a level that is higher than what I experienced in WoD. Q: What do you expect from us? A: I expect a nice friendly environment to play WoW in with good leadership and an enjoyable atmosphere. I expect to be having fun and goof around, but when/if I get to raid I hope that it is serious. Q: What are your long term goals in WoW? A: My long term goal in WoW is to become better at whichever role I am fulfilling and playing with people I enjoy spending time with. I enjoy the game most when I’m raiding and feeling part of a group that can achieve something good together. I have never been much of an achievement-hunter or collector in the game but I’ve recently started to pay attention to the other aspects of game other than raiding. Q: We have a focus on the social aspects in the guild. Do you intend to be a part of social activities outside of the raids? A: Yes. I enjoy doing older content or helping guildies doing whatever is going on. I also like playing other characters and leveling together with other people. Q: Is there anyone in The Hand of Shadow who can possibly vouch for you? A: If you ask Dawn he will probably say that I’m horrible and can’t even turn on my own computer. But don’t listen to him as he is blonder than Eminem in the early 2000’s. Q: Any additional information that would help your application? A: I am an easy going person that can adapt to most scenarios and enjoy spending time with different kinds of people. During my time playing this game I have played on very different levels from expansion to expansion, and I believe that I can adapt to whichever play style and mentality that is needed. That being said I always try to play to the best of my ability no matter what and in raids I am very focused and willing to perform and learn from others. I will discuss this application internally and get back to you as soon as possible. I would like to ask that you have some patience, as the Legion roster is a bit f a challenge to put together. Thanks for the fast response. I would be willing to go holy for Legion. That being said I have very limited experience healing on my paladin, but I have experience healing on other classes as I mentioned in my application. I would prefer though to go ret as I’m more comfortable playing it. I apologize for the significantly delayed reply. We made this decision earlier, but we noticed you had left the guild on your paladin, and wanted to ask you about that before replying here. However, since we still haven’t managed to contact you through Dawn or on Battlenet, here is the decision anyway. If you have changed your mind about joining the guild, please reply in this thread. We have decided to give you a trial spot as Retribution Paladin. You shall start your trial when Legion raids open. If you have any questions, you can reply here, or message any of Mikälie#2475, Creed#22658 and Cudor#2198. With the expansion here and still no contact, we consider this application abandoned.